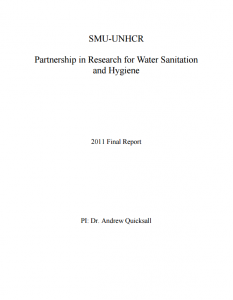 The SMU team conducted five sampling missions to UNHCR refugee camps in Uganda, Kenya, Bangladesh, Djibouti, and Liberia. Overall, these missions were considered a success with 17 camps, 7 villages, and a few additional sites visited. The team collected 213 camp samples and 229 total samples for analyses in the laboratory. 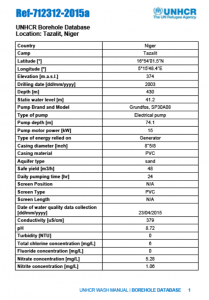 Camp conditions and source water characteristics varied widely amongst the five countries but also within the camps themselves. Tags: Water Quality Testing and Surveillance and Water Safety Plans. Locations: Bangladesh, Djibuti, Kenya, and Uganda. Organisations: Southern Methodist University. Categories: WASH Reference Documents and WASH Research Documents. Tags: Boreholes, Drilling, Water Supply, and Water Supply. Locations: Africa. Languages: English and English. Organisations: UNHCR and UNHCR. DatabaseDocTypes: Borehole Drilling Logs.